But sometimes such small changes in plans are a good thing. When I finally arrived at the exhibition I meet an old friend. I haven’t seen him for years and I’m probably the one to blame for that. I’ve been busy with much too many things. But today we finally meet again. I was happy to see him and we had time to talk. Egil was one of the first people I meet when I moved to the area I live in 16 years ago. He was one of the first artists to welcome me to the local art association and one of those who inspired me for many years. He managed to encourage me during a time that was quite difficult for me. At that time I was without a job, without money and afraid I wouldn’t make it in Norway. I remember well how afraid I was to have to return to the place and an environment where there was no place for me as the person I am. A place were artists were defined useless, lazy and unwanted part of society. Alternative ideas of how to live your life were oppress and beaten down. When I meet the people in the local art association they welcomed me and the meetings and exhibitions became an important place for me. 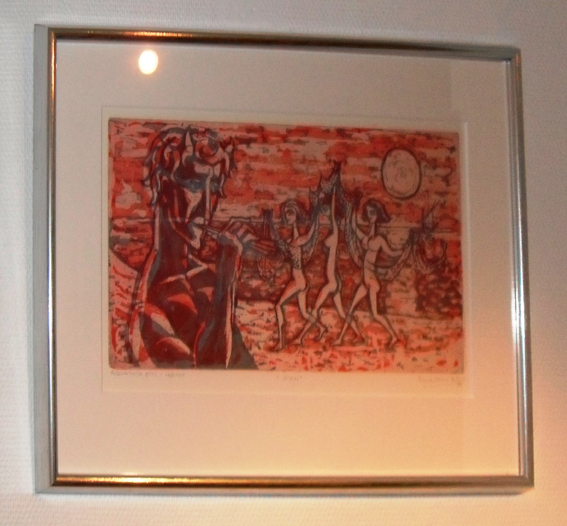 I started to exhibit my works with them and Egil was always there with kind words and well-intentioned critics. I learned a lot of him and it’s especially his graphical work that always has fascinated me. Now he’s almost 88 years old. Still painting and sometimes working with graphics. I finally went home with one of this graphical works called “Pan”. We were both very happy about it. Egil Midtsund was born in December 1924 in Oslo, Norway. He was educated at the Public Craft and Art industry school Carl von Hanno, Chrix Dahl and more as teachers. During his studies he worked at Leif Justers Edderkoppen Theatre as stage worker and theatre painter. He worked for many years as an exhibition designer, draw and conducted projects in Norway and Scandinavia, Europe, USA and China. He’s a member of Norske Grafikere.